Slots Magic - Why Play At Slots Magic Casino Online? Claim Best Bonus! This magical domain may sound like it only offers slot games to its users. But nothing could be further from the truth. As a matter of fact, Slots Magic also provides a range of other titles for players to enjoy, too. Slots Magic made its debut in 2014. 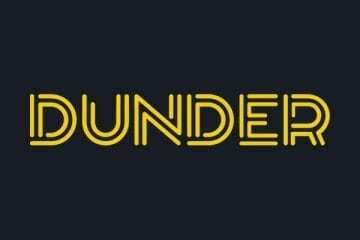 It has gone on to be particularly popular with players based in the United Kingdom. 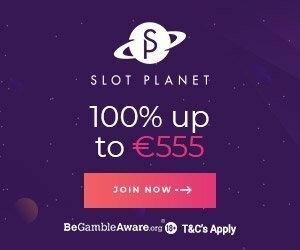 Claim £50 and 50 free spins! Other good casinos with many slots are Casilando and Slotsmillion. Grab the Slots Magic bonus below and play! The casino is operating by Skill on Net Ltd and is licensed out of Malta. But also by the Gambling Commission of Great Britain. This is a domain which offers the GBP currency, gameplay in English, and has a tidy little welcome bonus. The bonus is worth as much as £50 and 50 free spins when a new player deposits at the casino. There’s no shortage of other top deals, either, but we’ll come to those a bit later on. For now, let’s look at their games. Why Play At Slots Magic Casino Online? Slots Magic Casino does offer up quite the selection of titles for players to enjoy. A good number of those are themed on magic, illusions and fortune telling. As you might imagine for a domain with this type of theme. However, there are plenty of other themed slots which have nothing to do with magic at all to play there. Online slots and casino games are provided by 2By2 Gaming, Bally Tech, Barcrest, Big Time Gaming (BTG), Blueprint Gaming, ELK Studios, Evolution Gaming, Extreme Live Gaming, Foxium, GVG, IGT, Just for the Win, Lightning Box Games, Merkur Gaming, Microgaming, NYX Interactive, Net Entertainment, NextGen Gaming, Old Skool Studios, Play ‘n Go, Rabcat, Realistic Gaming, Red Tiger Gaming, RealTime Gaming, Shuffle Master, Slingo, StakeLogic, Thunderkick, WMS Gaming and Yggdrasil. The games collection at the site spans slots, roulette, live casino, blackjack, card games, video poker and a range of “other” games. Live dealer casino games have been provided primarily by Evolution Gaming. Although a handful of other providers have got in on the act, too. Top titles in this genre include Dream Catcher, Casino Hold’em, Benelux Slingshot Roulette, Baccarat Squeeze, Common Draw Blackjack, Golden Ball Roulette, Baccarat Control Squeeze, and Speed Baccarat. Other good casinos for live games are Casilando and Energy Casino. Naturally, big progressive jackpot slots such as Mega Moolah are always going to be appealing to fans. But other top non-progressive jackpot slots are worth a look, too. Rich Wilde and the Book of Dead, Jackpot Jester 50,000, Da Vinci Diamonds: Masterworks, Starburst, Vikings Go Berzerk, Baron Samedi, Cleopatra, It’s Magic, Pink Elephants, King Kong Fury, Da Vinci Diamonds, Vikings Go to Hell, Immortal Romance, Jackpot Jester 200,000, and Hong Kong Tower are top titles, to name but a few. Mobile casino players are not required to download software to play at this domain. Slots Magic do not have an app; thus their casino is mobile-friendly via the web browsers on all modern Android, and iOS (Apple) powered smartphones and tablets. Just open the site in the browser on those devices, and you’re good to go. If you are a Bingo fan, we recommend Gala Bingo or Mecca Bingo. Slots Magic offers an FAQ (frequently asked questions) guide. Which can be used to properly peruse a series of more commonly asked queries for answers. However, if you don’t get what you’re looking for from the FAQ. The casino also offers around the clock customer support via e-mail and live chat. Players are invited to contact customer support for any time and any reason. However, you needn’t waste your time inquiring about security at Slots Magic. Slots Magic Casino has its RNG (random number generator). The software independently tested and certified for fair play gaming by iTech Labs. The site is also fully licensed by the UK Gambling Commission and holds a Maltese gaming license to boot. Players should have no qualms about the level of security at Slots Magic Casino. As with any UK casino, most of the primary payment methods are represented and accepted at this domain. The site permits payments made using VISA, Skrill, Neteller, WebMoney, Paysafecard, EcoPayz and PayPal. Those deposit methods all have instant transaction times. Slots Magic doesn’t charge a fee for using them, although that is not exactly strange. Withdrawals are capped at £10,000 per month, and that isn’t particularly brilliant. Transaction times tend to range from 1-2 days for e-wallets, and between 2 and 7 days for card and bank transfers. 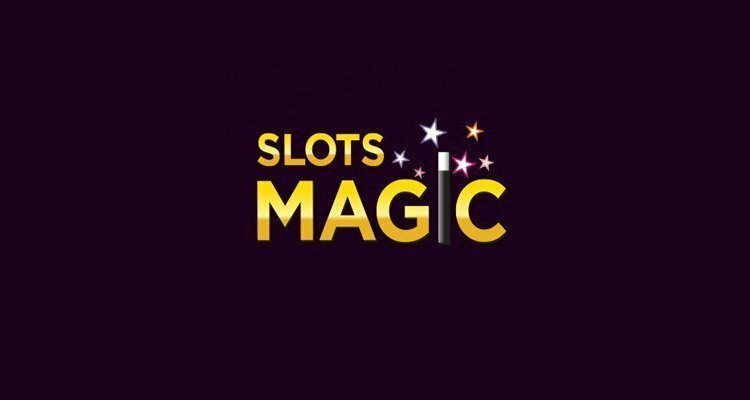 Slots Magic doesn’t advertise any transaction fees for withdrawals, though they do say that if there are any, they will be shown on the screen before a withdrawal is completed, so players have a chance to consider changing a method. That can best be described as less than helpful. 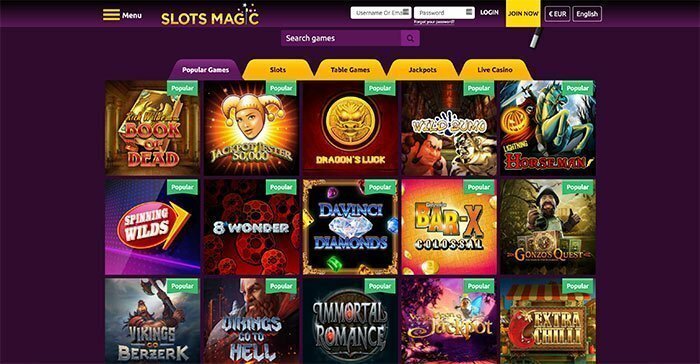 Visit Slots Magic and Play Now! After joining Slots Magic, there is a welcome bonus available for all new players. It promises a 100% match on any first deposit a new player makes. This offer is worth up to £50 and comes with 50 free spins. The free spins are played on the Rich Wilde and the Book of Dead slot. The promo bonus code of MAGIC50 must be entered to claim this welcome offer. This offer comes with very high wagering requirements of 60x, and that is no laughing matter. 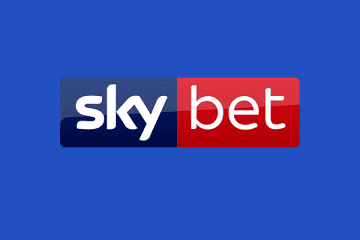 These wagering requirements are far higher than those you will find at any of the other leading UK online casino sites. A no-deposit bonus is not available for UK players. Slots Magic regularly runs tournaments and prize draw competitions, with freerolls available as well as tickets to the action. A VIP Lounge can reward players with free bonuses based on their gambling habits, and there is a Free Spins for a Year prize draw competition which players can enter with just a single deposit. Also available at Slots Magic Casino are daily and weekly offers. Free spins are regularly given away with the latter, while Daily Picks can see players select from a series of deals every 24 hours. Given the high wagering requirements of the welcome bonus, though, players are advised to read all the terms and conditions of any offer at Slots Magic before deciding to claim it.